Bone spurs are small projections of bone that grow on the skeletal body. Also known as osteophytes, bone spurs often arise from osteoarthritis and may also develop as a result of general aging and different spinal conditions. Bone spurs can be asymptomatic, but in some patients, depending on their location, they may result in debilitating pain. When you’ve been diagnosed with bone spurs non-surgical treatments may be recommended. Some patients may eventually need surgery for the removal of these bony growths. Bone spurs are a common development in the human body and are not always problematic. However, when bone spurs form on the spine, they can press against spinal nerves, leading to pain and numbness in various parts of the body. The pain will vary based on the location of the bone spurs, however, lumbar osteophytes and cervical osteophytes are the most common. Bone spurs are an enlargement of the normal bone structure. The boney structure is often smooth and forms over a prolonged period of time on the edges of the bones near the joints. Some common places where bone spurs can develop include the spine, shoulders, hands, hips, knees, and feet. Bone spurs can be an indication that there is increased pressure on the joints of the spine. The causes of bone spurs are often a reaction to changes in your joints due to diseases and/or aging, most commonly osteoarthritis. When bone is damaged, the bone cells sometimes overcompensate by creating extra bone. As osteoarthritis breaks down the cartilage in the joints of the spine, your body attempts to repair the loss. In many cases, this means creating new areas of bone along the edges of your existing bones. Your body may also create bone spurs in an attempt to add stability to the spine. Bone spur formation is the body’s attempt to increase the surface area of a joint to better distribute weight across a joint surface that has been damaged by arthritis or other conditions. Unfortunately, this can become a largely wasted effort by the body, as the bone spur itself can become restrictive, impinge on a nerve, and cause spinal stenosis. Bone spurs may also develop after a traumatic injury or due to a person’s lifestyle. For example, if your job requires you to lift heavy objects or complete repetitive motions, the force put on your joints can increase the risk of developing osteophytes. Poor posture can also lead to the development of osteophytes. Bone spurs themselves are not painful. However, when they rub against nearby nerves or narrow the spaces between the vertebrae through which nerves pass, they can cause severe back pain. Bone spurs may go undetected for years and not require any treatment. Where your bone spurs are located determines where you will feel pain and whether you will experience any other signs or bone spur symptoms. For instance, bone spurs that form on the vertebra body in your spine may push against your spinal nerves, leading to pain and numbness in various parts of the body. The symptoms experienced are often made worse with activity, including bending over or leaning over. For cervical osteophytes, dysphagia may occur. For many, relief is only found when they rest. As the bone spurs begin to impede on the nerves, the patient may experience pain, weakness, and numbness or tingling in the extremities. Diagnosing bone spurs begins with a clinical examination. Your physician will ask for a complete medical history and complete a physical exam. During the physical exam, the doctor may feel around your joints and back to pinpoint the pain. Radiographic tests, such as x-rays, may be ordered to get a better view of your joints and bones. Bone spurs on the spine may cause the foramen (the opening through which the spinal nerve exits the spine) to narrow. 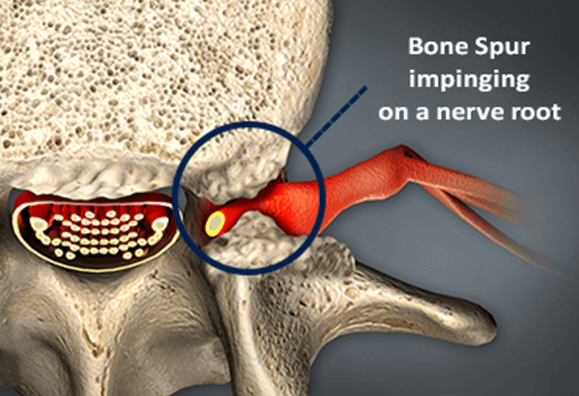 This narrowing of the foramen, also known as foraminal stenosis, puts pressure on the nerve, leading to tingling, numbing, pain, and debilitation. Bone spurs are often seen on imaging studies. Some testing that may be requested includes magnetic resonance imaging (MRIs), Computerized Tomography (CT scans), or CT scans with myelogram, which uses contrast dye to detect problems. Electro-conductive testing, such as an electromyogram, can help eliminate other nerve compression sources and determine if bone spurs are the underlying cause of the patient’s pain. When bone spurs become problematic and cause nerve impingement, potential treatments include anti-inflammatories, muscle relaxers, and pain medications. Physical therapy and cortisone injections might be prescribed too. These treatment options might provide some relief, but don’t usually solve the problem. If a patient has been suffering from a bone spur for more than three months, the condition has restricted normal movement, caused other serious difficulties, and conservative treatment has failed to resolve the problem, then surgical procedures may be necessary for long-term relief. When the non-surgical treatment options no longer manage bone spur symptoms, surgery may be needed to permanently remove the bone spurs. A foraminotomy/foraminectomy is a decompression surgery performed in order to increase the space of the foramen and hollow out the passageway where the nerve roots exit the spinal canal. The procedure involves the removal of bone or tissue that obstructs the neuroforamen and compresses the nerve roots leading to inflammation and radiating pain. The removal of part of the lamina is often necessary for the surgeon to gain access to the affected nerve roots in the neuroforamen. For this reason, the foraminotomy is often performed in conjunction with a laminectomy or laminotomy. A laminectomy/laminotomy is designed to relieve pressure on (decompress) the spinal cord or spinal nerve roots through the widening of the spinal canal. The procedure is carried out by removing or trimming part of the lamina (roof) of the vertebrae in the compressed area. The removal of part of the lamina creates an opening for the compressed nerves, relieving pressure on the nerve roots and reducing inflammation. The partial removal of the lamina may also allow the surgeon to remove any bone spurs or damaged tissue causing pain and inflammation in the patient. Those who have bone spurs may also benefit from self-care, such as resting, completing hot or cold therapy at home, modifying their daily activities, and wearing back support devices.